A report by the European Environment Agency released today shows that the European Union and all Member States but one are on track to meet their Kyoto Protocol commitments to limit and reduce greenhouse gas (GHG) emissions. Such an accomplishment should encourage all countries to agree on much larger reductions of global emissions, sealing a global deal in Copenhagen this December. Whereas the Protocol requires that the EU-15 reduce average emissions during 2008–2012 to 8 % below 1990 levels, the latest projections indicate that the EU-15 will go further, reaching a total reduction of more than 13 % below the base year. "It is encouraging that Europe's climate-changing emissions are expected to continue decreasing, outperforming the objectives set by the Kyoto Protocol. Such an accomplishment should encourage all countries to agree on much larger reductions of global emissions, sealing a global deal in Copenhagen this December. Commitments to deep emission cuts are urgently needed to preserve our chances to keep planetary temperature increases below 2ºC." The EEA report shows that the reductions in the period 2008–2012 will be achieved through a combination of existing and additional policies, the purchase by governments of credits from emission-reducing projects outside the EU, the trading of emission allowances by participants in the EU emission trading scheme (EU ETS) and forestry activities that absorb carbon from the atmosphere. The trading scheme primarily covers large carbon-emitting industries, which represent about 40 % of EU greenhouse gas emissions. Looking further ahead, almost three quarters of the EU's unilateral target to cut emissions to 20 % below 1990 levels by 2020 could be achieved domestically (i.e. without purchase of credits outside the EU). The report highlights the importance of the EU ETS in helping Member States meet their targets. It also stresses, however, that governments need to focus on reducing emissions in the sectors not covered by the ETS, such as transport, agriculture and households. How could the EU achieve the projected reductions? Existing policies and measures for the period 2008–2012 could account for 6.9 percentage points of the total reduction. If Member States implement additional measures as planned, the total reduction could reach 8.5 %, although this will largely depend on combined efforts in four main emitting countries (France, Germany, Spain and the United Kingdom). The use of Kyoto's flexible mechanisms by governments could contribute an additional 2.2 percentage points reduction. Absorbing carbon dioxide through enhanced carbon sinks (e.g.improved forest management) will contribute with an additional 1 percentage point reduction. Purchase of emission allowances and credits by EU ETS operators is expected to deliver a further 1.4 percentage point reduction. 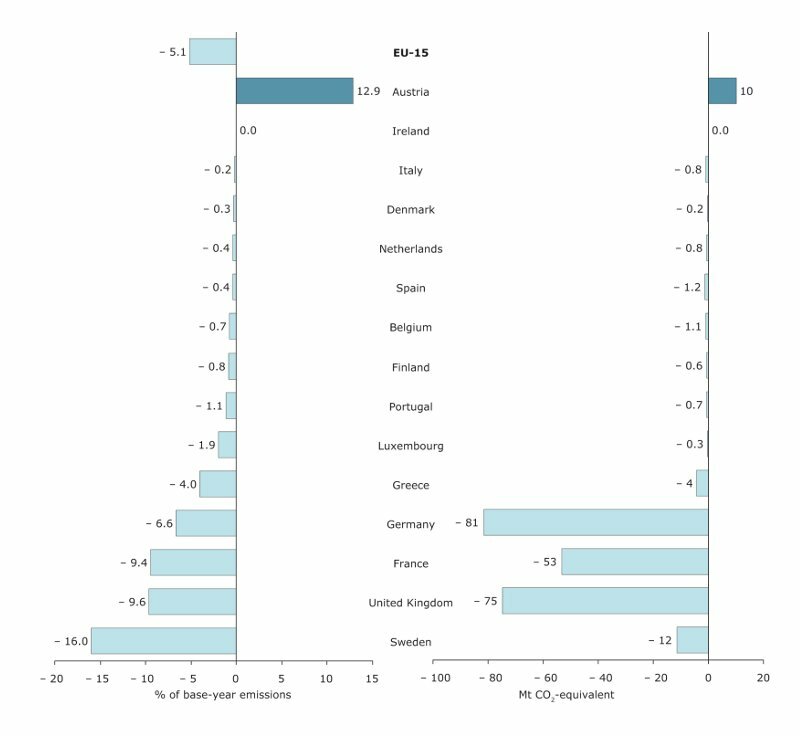 Five EU-15 Member States (France, Germany, Greece, Sweden and the United Kingdom) have already reduced domestic emissions below their targets. Only Austria expects to fall short of its commitment under current conditions and will have to intensify its efforts to reduce emissions in non-ETS sectors. All other Member States and EEA member countries with emissions targets under the Kyoto Protocol anticipate that they will meet their commitments. Member States' projections have started to take into account the recent economic downturn but the report finds that GHG emissions may still be overestimated in the short term. As such, the recession could bring about further cuts in emissions. Note: EU-15 figure in absolute terms (– 217 Mt CO2-eq.) not represented due to significantly higher scale. Countries are ranked by increasing absolute gap between their 2008–2012 projected emissions in the sectors not covered by the EU ETS and their corresponding Kyoto target. EU Kyoto Targets: The EU-15 has a Kyoto target to cut greenhouse gas emissions by 8 % from base-year levels (see below) by 2012. Within this overall target, each EU-15 member state has a differentiated reduction target; some should reduce emissions while others are allowed a limited increase. New Member States have individual targets except Cyprus and Malta, which have no targets. Countries can achieve these targets by various means. Base-year emissions: Under the Kyoto Protocol the GHG emission level in the 'base year' is the relevant starting point for tracking progress of domestic emissions for EU-15 and all Member States which have a Kyoto target. The EU-27 does not have a Kyoto target and an aggregated base year for the EU-27 is therefore not applicable in any discussion of progress towards Kyoto targets. It is important to clarify that the base year is not a 'year' per se, but the emission level from which emission reductions will take place. For carbon dioxide, methane and nitrous oxide, 1990 is used as the 'base year' for all EU-15 Member States. But for fluorinated gases, the EU-15 Member States can choose to use the emission levels in 1995 instead. Twelve of the 15 Member States have chosen to use 1995 as their base year for fluorinated gas emissions. In practice, EU-15 base-year emissions can be considered close to 1990 emissions. EU Emissions Trading Scheme: The EU Emissions Trading Scheme is the European Union's main climate change policy tool, which helps industries to cut their CO2 emissions in a cost-effective way. It requires a cap on emissions for all large CO2 emission sources. Domestic policies and measures: Domestic policies and measures take place within the national boundaries of the country (the promotion of electricity from renewable energy; improvements in energy efficiency; promotion of biofuels in transport; reduction of carbon dioxide emissions from cars; recovery of gases from landfills and reduction of fluorinated gases). Kyoto mechanisms: The Kyoto Protocol envisages market-based mechanisms that allow industrialised countries to meet their targets by benefiting from emission reductions in other countries. Under these mechanisms, Member States can trade emissions between themselves or acquire credits from emission-cutting projects they finance abroad. These mechanisms also help the transfer of low-carbon technologies to other countries and promote sustainable development. For more information on Kyoto mechanisms, see the UNFCCC website. For references, please go to https://www.eea.europa.eu/media/newsreleases/non-industrial-emissions-key-for-meeting-kyoto-targets or scan the QR code.